It had become a standing joke how the media were always keen to write Radio Caroline's obituary but, even to the most loyal and dedicated fan, the abandoning of the mv Mi Amigo in January 1979 really did seem like the end. Amazingly though, when the weather calmed down and a salvage crew was able to get out there the following afternoon, they found that the ship was still floating although a lot of water had got in. Peter Chicago, the chief engineer, volunteered to stay aboard, alone, overnight with just enough paraffin to keep the navigation lights burning. The next day six others joined Peter to help with the mopping up including DJs Tony Allan, Roger Mathews and Tom Anderson. Once again the Mi Amigo had survived. While Caroline was having troubles at sea, the listeners' magazine Caroline Newsletter was having problems with officialdom on land. The police warned the printer that if he agreed to print the seventh issue of the magazine he would be liable for prosecution under the Marine Offences Act. The circulation manager June Sutton was threatened too. Fortunately no charges followed and later, in a special edition of the newsletter dated Winter 1979/80, she revealed to the readers what had been going on behind the scenes. Tony Allan on the Mi Amigo. Photo by Marc Jacobs, kindly provided by Hans Knot. Easter 1979 was Radio Caroline's 15th birthday. The station had been off the air for nearly six months. Despite this, thousands of fans tuned in to 963 kHz (“319 metres”) just in case - and they were not disappointed. There was a signal. Caroline was back! 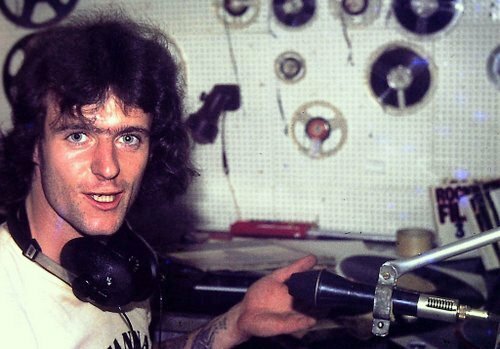 At 9.36am on Easter Sunday, 15th April 1979, non-stop music began; at 10.08 it was announced that programmes would resume at 11am and, sure enough, at 11.00 BST, 12 noon Dutch time, DJ Tony Allan re-opened proceedings. After The Fortunes' theme tune had died away, he taught the doubters a lesson. He played Chris Rea's Fool, If You Think It's Over. Caroline was unstoppable - now with a Dutch service by day, English at night. 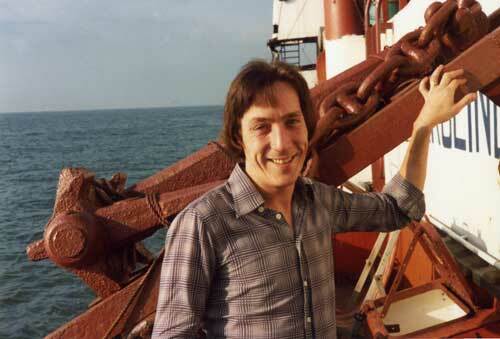 Although they were now broadcast as Radio Caroline, the Dutch shows sounded very similar to those of the late Radio Mi Amigo - not surprisingly as three of the DJs had previously worked on that station - Herman de Graaf, Johan Visser and Rob Hudson, later joined by a fourth: Marc Jacobs. All that was missing were the advertisements for waffles! Despite using the Radio Caroline name, the Dutch output was a separate concern. The new service was owned by Fred Bolland and run by Ben Bode. They hired the airtime from Caroline founder Ronan O'Rahilly and sold the advertising for it. The English programmes picked up where they had left off the previous year. Within days it seemed that Caroline had never been away. Stephen Bishop, now known as Johnny Lewis. Photo kindly provided by his Rounds And Sounds website. Most of the English DJs had been with the station before but there was one new voice, Stephen Bishop. Later known as Johnny Lewis, he is still with the current incarnation of Caroline, along with Richard Thompson (now known as Bob Lawrence), Stuart Russell (now called Nigel Harris) and Martin Fisher. Another ‘new boy’, Nick Richards, joined later in the year. The frequency change of 962 to 963kHz had been necessitated by the Geneva Frequency Plan of 1975 which had come into effect on 23rd November 1978, while Caroline had been off the air. The divisions of the radio spectrum had altered, meaning that many stations across Europe had been forced to change frequency. During early May the station closed early most evenings, eventually settling on a 10pm closedown. The following month the schedule was augmented by a number of sponsored shows, mainly evangelical, taking up as much as two hours of airtime a day. Roy Masters's How Your Mind Can Keep You Well in a Moment of Truth went out for an hour in prime time every evening. These programmes were a tremendous intrusion into the station sound but they brought much needed revenue to the Caroline coffers, depleted as they were after an expensive winter off the air. There were also Dutch religious shows courtesy of Dominee Tournavliet and Johan Maasbach. Other income continued to be raised by The Caroline Roadshow, a mobile rock disco which played successfully all over Essex, Kent and East Anglia. Tom Anderson. Photo shared on Facebook by Jeremy Chartham. 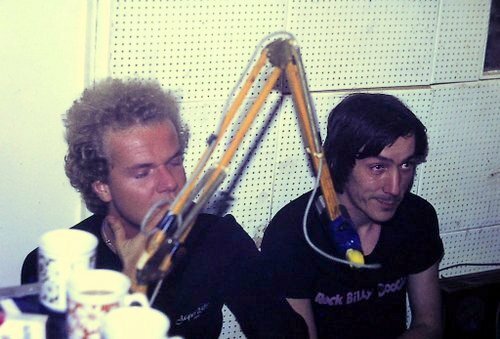 Dutch DJ Marc Jacobs, left, and Tony Allan. Photo shared on Facebook by Jeremy Chartham. During the summer of 1979 Caroline was not alone in the North Sea, as both Radio Mi Amigo and Radio Delmare briefly returned from new ships. 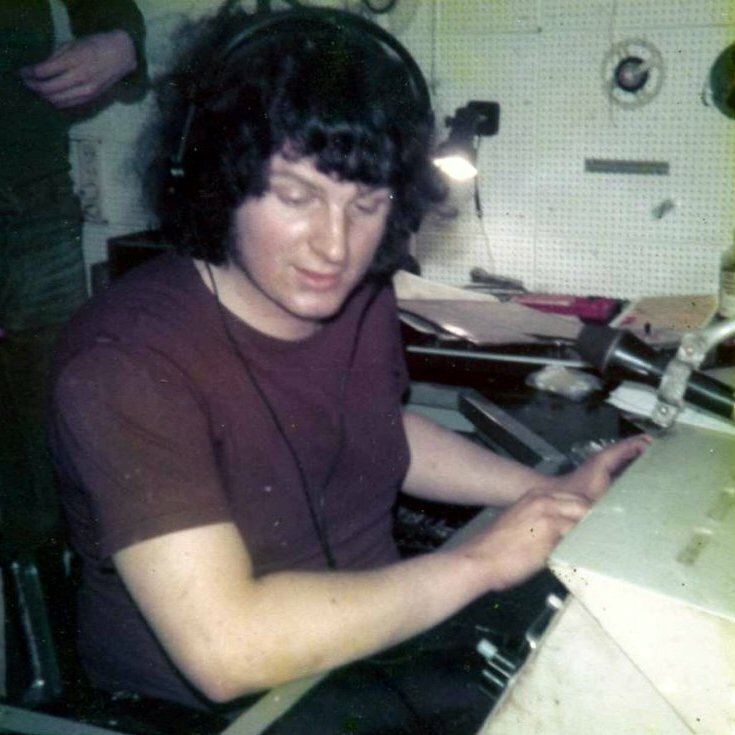 Radio Delmare was run by Gerard van Dam, formerly of Radio Caroline, and operated by the people behind the long-running Dutch land-based pirate Weekend Music Radio. The station had first been heard the previous year when programmes were broadcast from the mv Aegir. The station had broadcast in August / September 1978 but in the early hours of Monday 11th September, during bad weather, the anchor chain parted and the tiny ship began drifting towards some rocks. Fortunately assistance was at hand. The tug Smitbank towed the Aegir into harbour where the crew were arrested and the ship impounded. The Delmare organisation announced that it would return with a new ship but in January 1979 they suffered a set-back when the mv Epivan, intended as a replacement for the Aegir, was impounded by the Dutch police. Still the enthusiasts did not give up and in April their third ship, the 270 ton former fishing boat, Martina, now called Aegir 2, put to sea. Signals were initially erratic, beginning on 2nd June on 1575 kHz then, from 9th June, stabilising onto 1566 kHz. Programmes were a mixture of live and pre-recorded shows. Radio Mi Amigo began test transmissions on 25th June 1979 on 1100 kHz, 272.7 metres from a 69 metre long former grain transporter called Casablanca, now renamed Magdalena and anchored off Zeebrugge, Belgium. On Sunday 1st July she began transmitting programmes. The ship was registered in Puerto Cortes, Honduras, and had been fitted out in Greece. Two former Mi Amigo DJs Ton Schipper and Ferry Eden joined the new ship. Initially the new Mi Amigo broadcast 24 hours a day but this was quickly cut back and the station was frequently off the air for unexplained technical reasons. It was not until 9th September that it moved onto a recognised broadcast channel, 1098 kHz, 273.2 metres. Unfortunately for British listeners, reception was poor because of BBC Radio One being on an adjacent frequency. Things did not go well for either venture. The new Mi Amigo ship drifted four times in August and twice in September. On Friday 14th September she dragged her anchor and was carried in a north-easterly direction. On Monday she grounded on a sandbank. From there she moved on again. On Tuesday morning the non-stop music programme cut off abruptly at 6.10am as the Magdalena entered territorial waters. The captain was on shore leave and no one aboard could get the engines started. In the force 8 winds the ship continued to drag her anchor until she found another sandbank. There she began to take in water. Eventually the Dutch authorities pulled her off, towed her into harbour, and took her into custody. It was a sad, ignominious end to Radio Mi Amigo, but also a confusing one as the ship from which the station had taken its name was still broadcasting as Radio Caroline. The Magdalena was later sold for scrap. And on Radio Delmare, by September, there was only one person left aboard. Johan Rood, an engineer, was running the station single-handed, maintaining the ship and all the equipment, presenting some programmes and running the tapes, as well as cleaning and cooking. Eventually it became too much and the station closed on 28th September. In October five people were arrested attempting to take supplies out to the ship. Soon afterwards another tender enabled Johan to escape ashore and his place was taken by the ship's owner, a Mr Keers. He stayed out there on his own until, after running out of food and water, he gave up and set sail for shore. On the way back his engine packed up and, on 31st October, the Aegir 2 was towed into Stellandam harbour where, like her predecessor, she was impounded. By the autumn, Caroline was on her own again. In September Wilson, the station's pet canary, passed away. He was buried at sea with due solemnity and later replaced by another bird, Wilson 2. 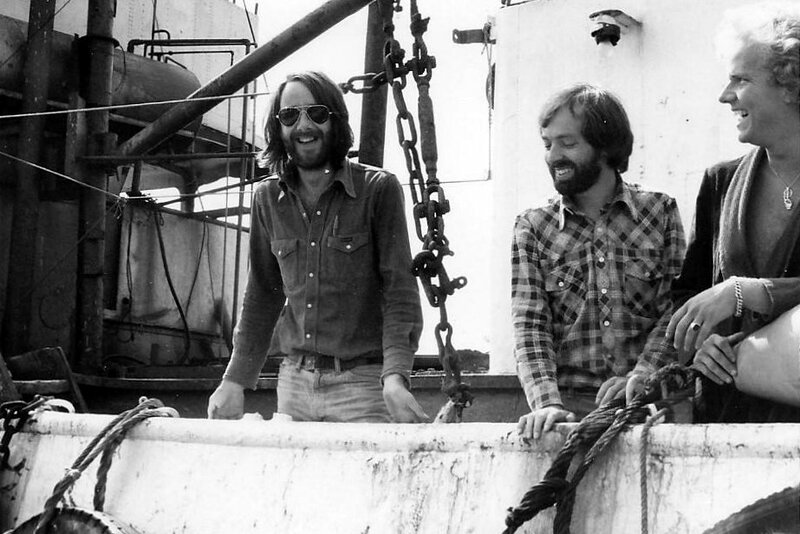 Left to right: Mike Stevens, Martin Fisher and Marc Jacobs. Photo posted on Facebook by Stevie Gordon. In November the station began running a daily pre-recorded two hour show called Space Play, made in Los Angeles by former Caroline DJ Mike Hagler, now using the name Michael Light. Mike's friends Emile Garrett, Cyril Scott and Sara Leone also occasionally hosted the show. The Caroline schedule now continued until 2am each day and, just before Christmas, it was extended to full 24 hour broadcasting. The all-night programming continued after the festive season was over although in January the service was slightly reduced to twenty-three and a half hours, allowing engineering checks to be carried out each day between 5.30 and 6.00am GMT. As Caroline rocked on into the '80s, efforts were being made to find a replacement ship. Even the greatest optimist realised that the mv Mi Amigo couldn't last forever. The final part of ‘Caroline In the 70s’ is coming soon.